Italian motorcycle-gear brand Dianese have released an awesome video featuring Valentino Rossi and Co. doing some off-roading at his Motor Ranch near Tavullia, Italy. With MotoGP on a summer break, Rossi invited Supermoto world champion Thomas Chareyre and Isle of Man TT legend Guy Martin for a fun-filled day out off-roading. True blue Rossi followers know the Doctor’s inclination towards off-roading and even though Rossi has won no less than 9 road-racing world titles, the Motor Ranch is his dream come true and he would always be happy to jump on a dirt or flat-track bike. 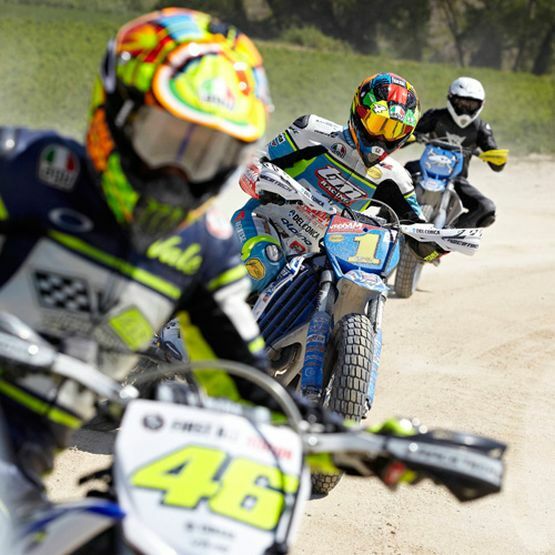 Far from being a proper race, Rossi having his rider friends accompany him on the track of the Motor Ranch is all about sharing the passion for two-wheeled adrenaline in a well-organized scenario and getting to know more about this fascinating sport. Looks like the Doctor surely knows all about ‘having good company’.